Muted with melancholy gray, drab slab architecture, and with Lenin looming over a windswept square, Soviet-era Oktyabrskaya may initially fail to inspire. Yet within its gloom, an unexpectedly ferocious spirit of Moscow’s past stalks the sentient sightseer, awaiting a chance to take a bite. Its original Streltsy settlements may have given way to New Russia’s internal security forces, but this neighborhood retains an energy that haunts and even intimidates. Its very foundations are built on the razed ashes of old Russia. Oktyabrskaya is also a visible reminder of the awkward transition from Communist legacy to capitalism. A view of its most striking feature, a towering bronze statue of Lenin, is juxtaposed with notably larger advertisements for Canon and Panasonic. Even the square’s name hasn’t quite reverted to the pre-revolutionary Kaluzhskaya, with many still calling the area Oktyabrskaya, a nod to its main Metro station. This outing begins thus, on the orange Kaluzhsko-Rizhskaya line of the Oktyabrskaya Metro station, touring the area’s main attractions and returning to the newly renovated and more memorable Oktyabrskaya station on the brown Koltsevaya line. But first a brief, and distinctly colorful, stroll along the edge of the Yakimanka district. Exit the Kaluzhsko-Rizhskaya line of the Oktyabrskaya Metro station, turn right and proceed north along Bolshaya Yakimanka, catching a glimpse of glistening gold Kremlin domes in the distance. At No 43 is the incredible home of the French Ambassador. Known as the Igumnov House, this ornately tiled gothic gem is a superb example of Neo-Russian architecture, which sought to incorporate the intricate handiwork of ancient Russian wooden palaces. Built in the late 1800s for wealthy entrepreneur Igumnov, this peculiar house remains perched in shadows even on a sunny day, perhaps owing to its morbid past. Legend has it that Igumnov buried his mistress alive within its walls, and that its architect committed suicide after Igumnov refused to compensate him for cost over-runs. After the Revolution, the building was nationalized and served as the Institute of the Brain, where the brains of prominent Soviets. including Lenin’s, were dissected and examined. Apparently so many “samples” were collected that the institute outgrew the mansion and moved to a larger location. The French Embassy occupied the building in 1938. 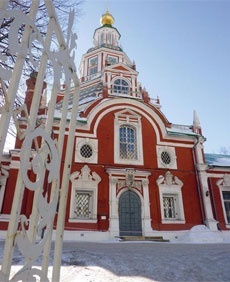 Cross the street under the next perekhod and backtrack slightly to Yakimanskiy pereulok and the vibrant early 18th century Church of St. John the Warrior (Tserkov Ionna Voina), built for Peter the Great. The church remarkably remained in operation throughout the Soviet era and even housed famous relics from other destroyed churches, some of which are still here. Continue downhill along Yakimanskiy per, turning left at the bright rainbow graffiti onto Maronovskiy pereulok, which brings you to the busy Sadovoye ring road. 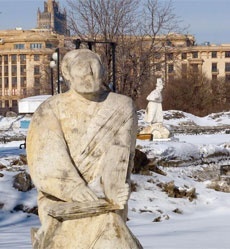 Before a closer look at the square’s Lenin statue to the left, take a short walk to Park Iskusstvo, or Muzeum Park of the Fallen, where Communism statues litter the grounds. Amongst the extensive sculpture garden, the park displays the fallen stone remains of Lenin, Brezhnev, and Dzerzhinsky, amongst others. More than 700 sculptures abound, many pulled from their Soviet pedestals, but as many from today’s avant-garde artists. Sharing the grounds are the “new” Tretyakov on Krymsky Val, where modern art from the early 1900s to today is brilliantly exhibited, and the Central House of Artists. Leaving the gardens, you can’t miss the gaudy grounds of Gorky Park across the road. This 1920s amusement park was the dream of Soviet children, a loud and colourful playground. It continues to operate year-round, is the site of a yearly drunken brawl on the Day of Paratroopers. It is a quintessential piece of Moscow kitsch. With this image in mind, a return to the ominous Lenin of Kaluzhskaya square is inevitable. Originally a cattle-merchant suburb on the road to Kaluga, several of the square’s existing streets take their names from this earlier time, such as Mytnaya street (referring to fees and taxes collected on cattle) and Koroviy Val (cow street). The stone ramparts of Kaluzhsky Gate (originally constructed of wood in the 1500s) protected the region until the 18th century, most notably against a Polish assault on Moscow in 1618. The scene of a mass execution of Streltsy in 1698 under Peter the Great, the square is now dominated by a hulking statue of Lenin, as well as the Oktyabrskaya Metro station and the well-guarded Ministry of the Interior (MVD), built in 1978 on the site of the destroyed Church of the Holy Mother of Kazan. 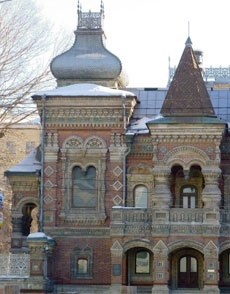 The church was a Byzantine- style gift to honour Russia’s victory over the Tatars. It was converted to a movie theatre in the 1930s. As one of the classic examples of tragic idiocy, the church survived Stalin only to be destroyed under Brezhnev, who was purportedly keen to create a spacious square of modern concrete might to impress the visiting U.S. President Nixon in 1972. Despite public outcry, the church was leveled. However, apparently Nixon’s route through the city changed; he never saw the square. It is almost impossible to imagine prerevolutionary Kaluzhskaya, which was a more intimate square of churches, trams, and small alleys, as well as an earthen prison. The only church now on the scene is a chapel next to the MVD building, completed in 2000. With its rich honey-perfumed interior, the chapel is worth a stop as a quick escape from the busy square; and with a bit of luck, or divine intervention, you may also be treated to the heavenly voices of its small choir. The bronze statue of Lenin by Kerbel and Fedotov was erected in 1985—the last of its time. From his pedestal, Lenin towers over the working-class and soldiers waving in glory beneath him. The location is also a popular gathering place for Communist demonstrators, particularly on 7 November. The recently renovated Oktyabrskaya Metro station is not to be missed. Originally opened in 1950 as Kaluzhskaya station (until 1961), the neoclassicalstyle design of high arches and bas-reliefs of military triumphs is really quite stunning. Bright marble and gilded white casts add to the overall glory on display. A light blue sky in an empty alcove represents desire for peace.